April 19, 2019 CONNY Boys Rules Test Passed List *- A list of individuals who had passed the CONNY 2019 Boys Online Rules Test as of 3:37 PM, on Friday, April 19, 2019. April 19, 2019 CONNY Girls Rules Test Passed List *- A list of individuals who had passed the CONNY 2019 Girls Online Rules Test as of 3:37 PM, on Friday, April 19, 2019. Declaration and Scheduling procedures- Comprehensive guide to declarations pre-season and scheduling during the season. Linking Rosters *- Instructions for linking rosters to the CONNY site, including coaches and managers. Linking Teams to the CONNY Site *- Step by step instructions as to how to use your own league athletics site to link teams to the CONNY site. CONNY Girls Rules Test Passed List April 20, 2018 *- A list of individuals who had passed the 2018 CONNY Girls Rules Test as of 2:50 pm on April 20, 2018. April 17, 2017 CONNY Boys Rules Test Passed List *- A list of those who had passed the 2017 CONNY Online Boys Rules Test as of Monday, April 17, at 3:00 pm. April 27, 2017 CONNY Boys Rules Test Passed List *- A list of individuals who had passed the 2017 CONNY Boys Rules Test as of 10:45 AM, Thursday, April 27. April 27, 2017 CONNY Girls Rules Test Passed List *- A list of individuals who had passed the 2017 CONNY Girls Rules Test as of 11:00 AM on Thursday, April 27. April 7 CONNY Girls Rules Test Passed List *- A list of those who had passed the 2017 CONNY Girls Rules Test as of 1:30 pm, Friday, April 7. April 7, 2017 CONNY Boys Rules Test Passed List *- A list of those who had passed the 2017 CONNY Boys Rules Test as of 1:15 pm, Friday, April 7. May 12, 2017 CONNY Boys Rules Test Passed List *- A list of individuals who had passed the 2017 CONNY Boys Rules Test as of 2:30 PM, Friday, May 12. May 12, 2017 CONNY Girls Rules Test Passed List *- A list of individuals who had passed the 2017 CONNY Girls Rules Test as of 2:50 PM, Friday, May 12. June 3, 2016 CONNY Boys Rules Pass List *- - List of those who have passed the 2016 CONNY Boys Rules Test as of 15:25 on June 3, sorted by PROGRAM. CEP Level column shows claimed completion of: A-US Lacrosse CEP Level 1 Course online or in-person; B-US Lacrosse CEP Level 2 Course online or in-person; C-US Lacrosse CEP Level 1 Certified Coach; D-No US Lacrosse CEP Courses. June 3, 2016 CONNY Girls Rules Pass List *- List of girls coaches and officials who had passed the 2016 CONNY Girls Rules Test as of 15:20 on June 3, 2016, sorted by program. 09NOV17 Minutes *- Minutes of the November 9, 2017 Fall Meeting of the CONNY Board of Directors, approved at the January 30, 2018 Annual Meeting. 30JAN18 Agenda *- Agenda and proposed slate of 2018 officers for January 30, 2018 Annual Meeting of the CONNY Board of Directors. 2018 CONNY Birthday Ranges by Grade *- Birthday ranges that determine player eligibility. 2018 CONNY Lightning Boys Rules *- Rules of play for all CONNY Lightning Boys competition. 2018 CONNY Sr. & Jr. Boys Rules *- CORRECTED Rules of Play, with Authorized Rulings, for all CONNY Senior and Junior Boys competition. 2017 CONNY Senior & Junior Boys Rules of Play *- Because US Lacrosse Boys Youth Rules are no longer in the back of the NFHS Rules Book, and the new US Lacrosse 2017 Youth Boysâ€™ Rulebook does not include the complete 14U Rules or the Approved Rulings (ARs), we have combined all these sources into a single document which also includes all CONNY modifications to NFHS and/or US Lacrosse Youth rules. The Senior rules are mostly unchanged from 2016. The most salient changes from 2016 are body and stick check restrictions for Juniors. CONNY Bantam Philosophy- CONNY's position on Bantam play (kindergarten-2nd Grade). 2017 CONNY Birthday Ranges by Grade *- Details which birthdays play with which grades. 2017 CONNY Grade-based Player Segmentation FAQs *- Answers questions about the 2017 CONNY Players Segmentation Policy. 2017 CONNY Grade-based Player Segmentation Policy *- Describes changes to CONNY player segmentation policy adopted by the CONNY Board of Directors on September 27, 2016. 2016 CONNY Senior Boys Schedule *- updated 6/10/16 20:05. 2016 CONNY Senior Girls Schedule *- updated 12:38pm 6/10/16. Change to start times in Senior Peach bracket. 2016 CONNY Venue Information- Important information regarding parking, vendors, food, etc. Play4theCure- Background and event instructions regarding the 2016 CONNY Play4theCure weekend. 2015 CONNY Senior Boys Tournament Schedule *- ver 2 (revised 6/4/15 11:38 am)-only minor typos corrected, no changes to times or brackets from previous version. 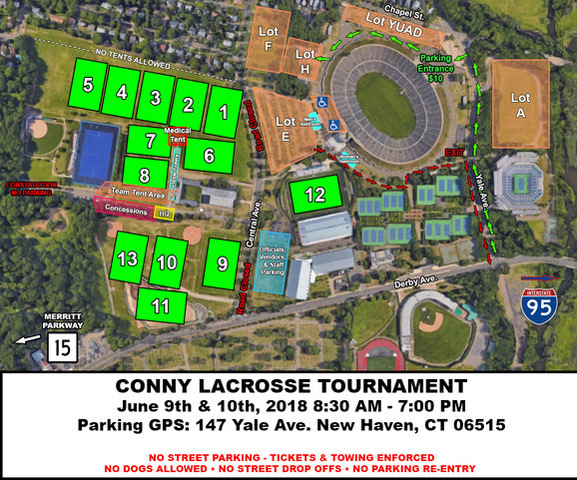 2015 Yale Venue Information *- Parking and other logistical information for the 2015 CONNY tournament at Yale. CONNY Boys Tournament Rules Differences *- This document covers only those rules that are different during the tournament than they are during the regular season. 2014 CONNY BOYS RULES of PLAY SUPPLEMENT *- Describes CONNY amendments to the NFHS Boys Lacrosse Rules and the US Lacrosse Boys Youth Rules approved by the CONNY Board of Directors November 19, 2013. 2013 CONNY Boys Rules of Play *- CONNY modifications to the NFHS Boys and US Lacrosse Boys Youth Rules of Play. 2013 Girls Rules Changes & POE *- This document outlines the specific changes that were made to the 2013 Rules and specific Points of Interest. 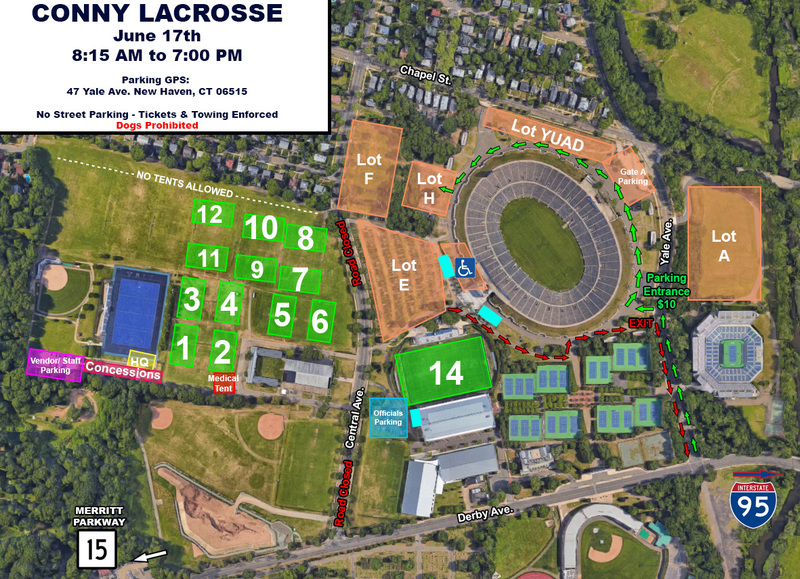 Yale Field Map *- Field map and venue layout for the 2012 CONNY Lacrosse Tournament at Yale University fields. 2012 Scheduling Systems and Procedures *- Read this document FIRST for scheduling timetable and procedures. ACTUAL Profile-Tier Form- This excel spreadsheet must be completed and returned to either Rich Greenwood (boys) or Trish Weber (girls) by May 15th. 2011 CONNY TOURNAMENT BOYS RULES & INFO. *- General rules, information, and guidelines for the boys U11 Lightning, U13 Junior, and U15 Senior CONNY Tournaments. Revised and re-posted at 1:24pm on 6/3. 2011 CONNY TOURNAMENT SCHEDULE - SENIOR AND 7 BOYS *- Game schedules for the 2011 CONNY Tournament for Senior (U15) and 7th Grade Boys Teams. REVISION #7 posted 6/9 at 10:35pm. 2011 Lightning Girls Festival Schedule *- The playing schedule for U11 girls on Saturday, June 4 at Yale University. 2011 Yale Field Map *- Field Map for the 2011 CONNY Tournaments at Yale University athletic fields. CONNY Code of Conduct & Participation Contract *- Every player, parent, or coach who wishes to participate in any CONNY event must sign this contract. CONNY USL Endorsement *- A letter from US Lacrosse President and CEO Steve Stenersen endorsing CONNY's community-based philosophy and practices, and warning about the recent increase in unscrupulous for-profit "Select," "Elite," and "Club" programs. Stenersen also warns parents against too early specialization, in sports and otherwise. CONNY Sportsmanship Committee Procedures *- Details procedures the CONNY Sportsmanship Committee follows to address complaints of untoward behavior.